Sultana was built at Pallion, Sunderland in 1854 and registered in London. She was 775 tons built of oak, a ‘late frigate’ hull design with three masts, deck + poop. Her dimensions were length 154.5, breadth 31.5 ft., depth 21.5 ft. with a draught of 16 ft. . Official #25241, Commercial Code Signal P.F.D.R. . She was still sailing in 1883 with a Liverpool registration, after which I can find no record of her. .
Sultana was employed as a convict transport for Western Australia. After her fitting out at Deptford in April/May, she picked up convicts in Sheerness, Portsmouth, Portland and Plymouth, leaving on May 28, 1859 bound for the Swan River Colony . 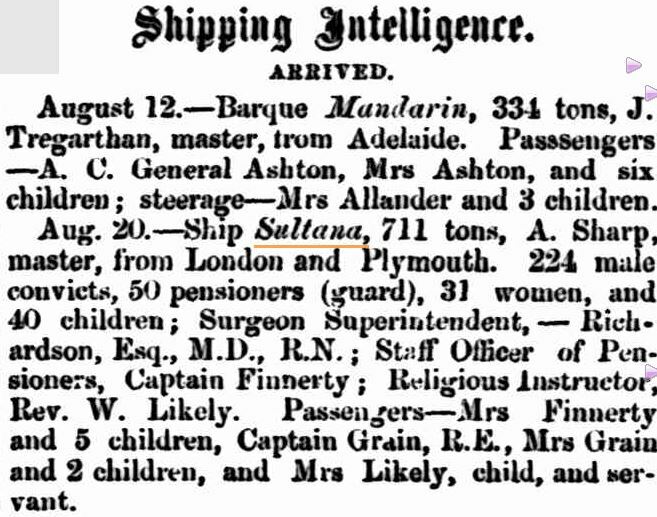 The voyage took 82 days and the Sultana arrived in Fremantle on August 19, 1859 . She took on a cargo of jarrah timber at the Vasse and then returned to Fremantle from whence she sailed for Colombo in November . Arrow Leithead and his brother Andrew, sons of shipbuilder James Leithead, were initially in the shipbuilding business together, but in 1850 they dissolved their partnership. Arrow continued to do well on his own and a year later was employing 36 men and 26 boys at Pallion, Sunderland and between 1850 and 1855 built at least seven ships . Referring to Arrow Leithead’s ships, it was said: ‘These are the highest class of that day. Must have been good for Dunbar to take one for his Blackwall & India fleet’ . 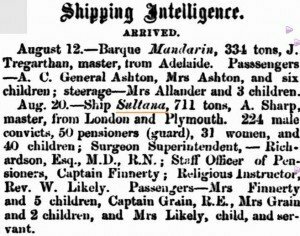 Sultana was built for a shipping owner and/or company by the name of Hodgkinson, about whom I can find nothing from my usual sources. However, by 1857 the ship had been acquired by Duncan Dunbar, owner of the biggest sailing fleet in the world in the mid-19th century. Dunbar was a great believer in India-built ships and his vessels built in Moulmein, Burma were of teak cut from the forests that lined the banks of the river surrounding the yard. 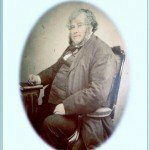 His fleet was mainly utilised as convict and immigrant transports and troopships in the Crimean War. .
Captain Arthur Sharp; his Chief Mate and other officers of the ship were much praised by the Surgeon Superintendent . Sharp seems to have been Master of the Sultana for most years since her maiden voyage until her voyage to WA. He corresponded with his sister in Tasmania about his voyage on Sultana in 1859 . 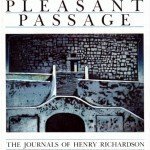 Henry Richardson, MD wrote a journal in two volumes of his voyage to Western Australia, his short stay in the Colony and his return to England via the Cape on Lord Raglan . He described his sojourn in WA and gives us a contemporary view of Colonial society which is both interesting and outspoken. Richardson was born in Berwick, Northumberland son of a printer/publisher. He was 41 years old and single when he made his only journey on a convict ship. Richardson married Margaret Crossman in 1869; they had six children before he died in 1885 aged 68 . Rev Adam Likely and Mary Ann (nee Patterson) had been married three years when they disembarked from Sultana. Rev Likely served as chaplain in Swan parishes from 1859 to 1864 after which he served in the Diocese of Goulburn, NSW – Braidwood (from 1864) and Adelong, Gundagai (from 1873)  . Adam and Mary Ann Likely had two daughters in WA and three sons in NSW. Adam died in 1884 and Mary Anne in 1889 . There were 224 convicts on board: 165 English, 5 Welsh, 18 Scotch, 29 Irish and 7 Foreigners; 201 could both read and write. No deaths occurred on the voyage . A dozen convicts had been tried and sentenced at Army courts martial of whom at least four were veterans of the Crimean War. John Cowell, John Farthy, Matthew Sherlock and Joseph Sullivan had each been sentenced to four years transportation for various offences in Canada and Barbados . While details of convicts arriving on ships from 1850-1868 are well documented, there were serious shortcomings of the records of arrivals of other passengers in local, Western Australian, resources: pensioner guards, warders and gaolers, military and free settlers, along with the names of wives and children of these ‘other passengers’. Sometimes we were fortunate enough to find listings or random names in the Surgeon Superintendents’ journals; there are pay lists for the pensioner guards surviving for some voyages (albeit often in bad condition); Army service and discharge documents; newspaper shipping intelligence reports and obituaries (not necessarily reliable); birth, death and marriage indices and certificates (if the researcher can afford them); but there is only one surviving census for this period (York). Thus research for passengers was hit and miss, and that of the Sultana was no exception until M S James published A Superior Body of Men. (March 2016) This well researched book added many new Crimean War veterans on the Sultana’s voyage, and we can now identify 14 military pensioners who saw action in that War. Lt. Col. Bruce in his return of enrolled pensioners and their families recorded 50 pensioners, 31 wives and 40 children arriving on the Sultana . These numbers were confirmed in the newspaper reports of the time . The DPS website records only seven pensioner guards, three wives and seven children. The DPS website list comprised Gibbs, Mason, Stephenson and Woodhead with a reference to Richardson’s journal. These men were warders from Portland, Dartmoor, Chatham and Portsmouth respectively. Their sole function was to accompany and supervise their respective convict charges on board Sultana prior to sailing; Richardson states that ‘on departure of the Warders I gave each of them a certificate’ and comments on their work habits. Thus these men disembarked prior to leaving England and did not come to WA. Richardson records no other warders on board, referencing only two pensioner guards who acted as warders throughout the voyage. Captain Charles Finnerty. Only four Fiinnerty children left England on the Sultana but a fifth child was to arrive in WA; Evangeline Alice was born on the voyage on 16th June and baptised by Rev. Likely . Some believe that Charles Finnerty Junior came to WA with his parents, but this cannot be the case given his career path. By the date of sailing Charles Junior (born 1840) was already an officer in the 75th Regiment of the British Army. He had joined the regiment as an Ensign without purchase in January 1858 and was promoted to Lieutenant in September 1860. He transferred to the 99th Regiment serving in China, and in 1864 discharged from the Army to serve (from 1865) in the 2nd Waikato Militia in New Zealand  . 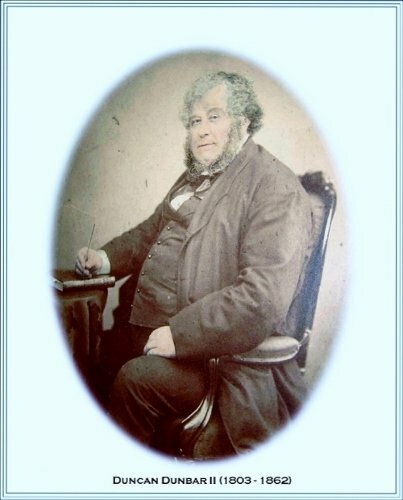 Edward Metcalfe Grain was born in Gibraltar in 1827. His military career began early as a “gentleman” Army Cadet in the Royal Engineers promoted to 2nd Lieutenant on 1st May 1846. He left England to fight in the trenches of Sevastopol during the cruel Crimean winter of 1854/55. From this campaign he was promoted to 2nd Captain. He became a full Captain just two months prior to boarding the Sultana. Grain became the last commander of the Royal Corps of Engineers in WA . Lloyds Register of Ships (online). 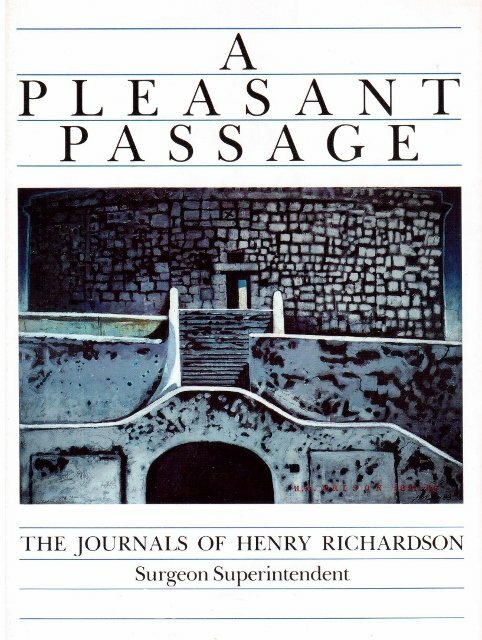 A Pleasant Passage, the Journals of Henry Richardson, Fremantle Arts Centre Press. A copy of the original manuscript is held in the Battye Library (MN1168). Perth Dead Persons Society (DPS), Convicts WA (online). Inquirer & Commercial News; Perth Gazette, August and November 1859. James Watson Corder’s Manuscript of Sunderland Family History pp.365, 367. Peter Searle’s Sunderland Site (online). Correspondence of Captain Arthur Sharp dated 1852-1865, State Library of Victoria. Misc. Birth, Death & Marriage records in Ireland, England and Australia. Consolidated Index to [WA] Government Gazette 1836-1890, p.141. NSW Government Gazette 1864 (p.1952) and 1873 (p.1188). Return of Enrolled Pensioners and their families who have landed in Western Australia from England between 1st June 1850 and 9th January 1868, Ref. PRO London, C.O. 18/159 folio 168. Maritime Births 1854-1860, Class BT158, National Archives, Kew. Statement of Services Charles Finnerty (junior) WO76/47/39, National Archives, Kew. Southern Provinces Almanac 1866, New Zealand Army List, Colonial Forces p. 48. Statement of Services Edward Metcalfe Grain WO25/3913/180, National Archives, Kew. This article first appeared in the EPG Gazette, the newsletter of the WA Genealogical Society’s Enrolled Pensioner Guard Special Interest Group. It has been edited for inclusion in this website. © Diane Oldman 2015, revised 2016.